I have been trying to carve out a little time here and there to fix the paths to downloads I've shared in the past. As of now the most requested stuff is fixed, the egress family and railing files. If you try to download something and hit a page not found warning, drop a comment in the post to bring it to my attention and I'll make it a priority. The other day I was looking at a sheet a user reported it was impossible to select a floor plan view on. It seemed as though Revit did not see the view port on the sheet. People frequently pin views to make it a bit harder for other people to move them on a sheet accidentally. That will still allow a view port to be seen by Revit, it will still highlight as the cursor travels over it. Then I thought of right-click Hide In View > Element. I used Reveal Elements and I could select the viewport. Using that tool does not hide what is visible in the view, it just disables the ability to select the view port. Good? Bad? It isn't expected, well I didn't expect it. It is fairly common knowledge that we can change a built-in parameter like Width from Type to Instance by going through the side door, selecting a dimension assigned to the parameter and changing it to Instance on the ribbon (see the image). Kurt Thompson wrote to me to share how he gets around this issue when the parameter isn't something a dimension can be associated with. Specifically he was referring to a thread at the Autodesk User Forums where a member (electrical focus) was asking Autodesk to change the default parameters for Mains (instance), MCB Rating (type) and Subfeed Lugs (type). They argue that each parameter should be the opposite of the current configuration based on how the information is really dealt with (not that he needs me to, but I agree with him). Create a Shared Parameter built exactly like the built-in parameter you need to change but make it Instance instead of Type. Starting out with a Generic Model family, add the new parameter. Now assign the family to the category Electrical Equipment, Revit will replace the shared parameter with the built-in parameter but it will retain the Instance (or Type) property setting from the shared parameter. Give it a try." This warning appeared quite a bit with Revit 2016 and patched in subsequent updates. I've clicked Restart to no joy and I've submitted the error. 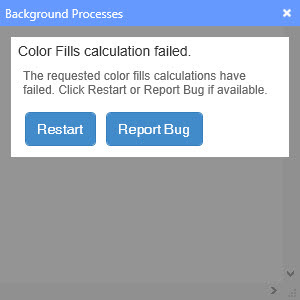 I've done the Edit Color Scheme and Cancel process described for Revit 2016 with no joy either. Hopefully it will get sorted out again. Alternate title: Mr. Revit OpEd finally does something (tho basic) with Dynamo! I used this problem as an excuse to dig into Dynamo a bit. 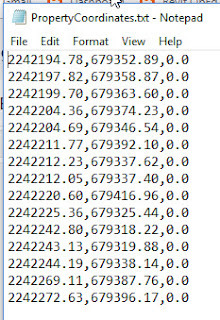 I created the attached graph to read a text file with coordinate values, one line per X,Y,Z values. I created a 3D cylinder and model lines to form a target symbol family, 3D and fairly large so I could see it anywhere in the model. 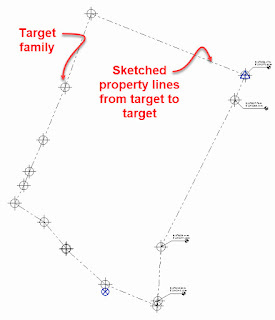 The graph places a target family at each coordinate location. Before running the graph, I assigned the Project Units for Length to Meter. 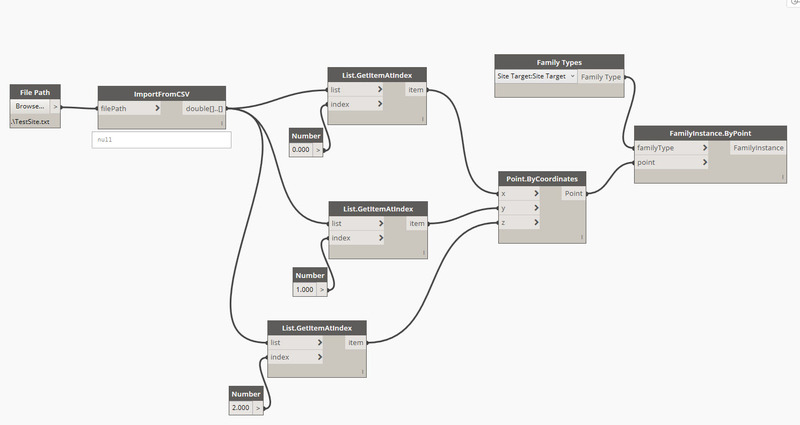 Then I ran (manual) the Dynamo graph to place the target families. 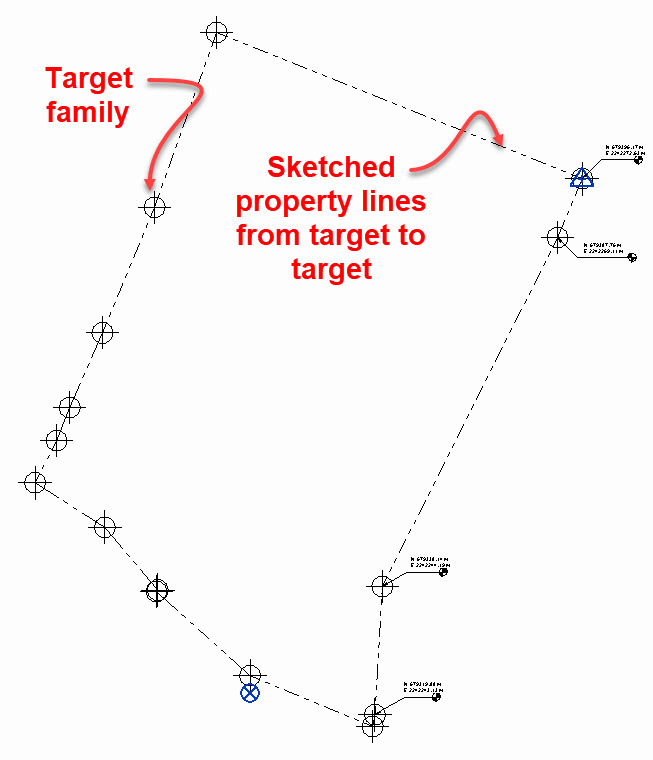 The last step was to start the Property Line tool and sketch the property boundary segments from target to target, which looks like this. 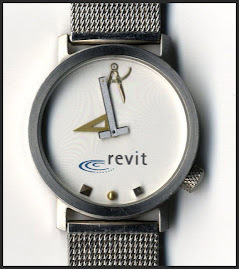 It was necessary to move the points closer to Revit's origin so they were not so far away, since Revit hates that. After doing that, I moved the Survey Point (not clipped) to one corner of the property (target family location) and then used Specify Coordinates at Point at that location using the coordinate values for that corner. This will allow me to export the result to DWG, if necessary. 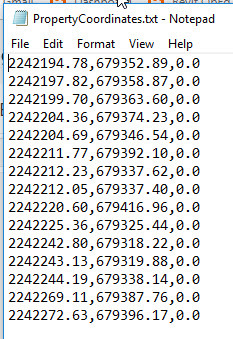 I also created a specific Spot Coordinate family type so I could identify some or every target location and make sure each reports the correct coordinates, double checking my work so to speak. I probably spent a couple hours on this, mostly trying to get my head wrapped around which nodes in Dynamo to use. The next time I'll be twice as fast!